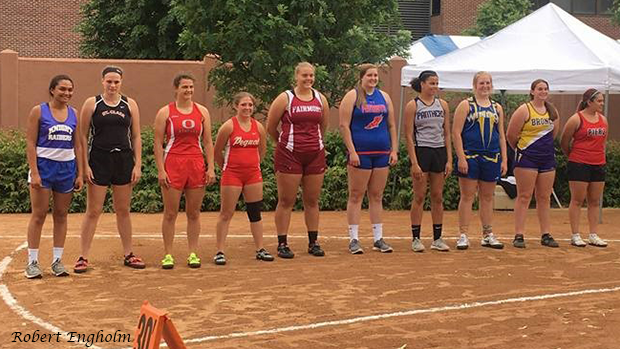 Shot put- 39' 7 ½"
I have gone to State two times in both the shot and discus. I went in 2016 as a freshmen and didn't medal in either event, and then I went last year (2018) I won medals in both the discus (4th) and the shot put (7th). My distances for my throws last year were 124'11" in the discus and 39'7.5" for the shot. How did you first get involved with track, and what other sports have you done? I started track when I was in 6th grade. I wanted to join track because I loved to do track and field day in Elementary school, and also I looked up to my older brother Dalton who was in track. I also have been in cross country (which I started in 6th grade) and basketball (which I started in 2nd grade). My most memorable competition was when I was in 7th grade at Walker. One of the volunteer coaches named Bud Bjorn gave me a four-pound med ball and I was messing around throwing it and it was going about 50 feet or so. After a bit, I went and put it away because competition was about to start. I grabbed my favorite shot put (which I named Fulisha) and was getting ready to throw when all of a sudden 3 big shot putters came up to me with their coach and they were crying. The coach wanted to know my age and wanted to see my shot put, and said I could throw really well. That's when I realized that they thought I was actually throwing an eight-pound shot put that far. So I showed them my med ball and the girls all had a good laugh and wiped their tears and they explained that they thought I could throw that far and they didn't want to lose to someone as little as me. They still ended up being surprised though, because I threw really well and placed at a varsity meet for the first time (6th place). Tell me about one of your favorite track-related memories. My most memorable moment at practice was when I was in 9th grade and I had a throw off with our long distance coach Jeff Brever. To my surprise he knew what he was doing. He beat me with a throw of 36 ft. At the time I couldn't throw that. The cool thing about that mark is that, that same year at Sections I came in ranked low and I threw a 36 foot throw and took over the first place position and went to State for the first time. 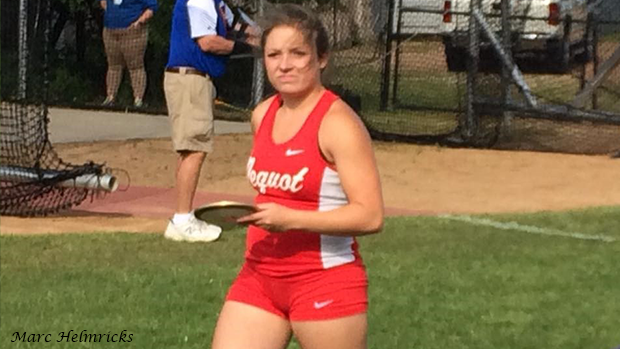 I also went on to do well in the disc and placed second, so I moved on to State in that as well. Who are some of your favorite athletes to compete with? I love to compete against Jacob Fox and Nick Barth who are my teammates. They make everyday fun and also help to push myself to new limits. My parents supporting me has been the most helpful because without them I couldn't do half the things I do. My coach Bud Bjornaraa ,there are no words that do justice for him he is very extraordinary and he volunteeres his time which I am so thankful. Bud not only teaches me and my teammates about throwing but about life, he has taught me things that I can take with me through my life. My mom and dad Angie and Robert Engholm and my little sister Ashley never miss a meet. Pequot's long distance coach Jeff Brever also sheers me on. Also my Uncles Donald, Tucker, and Darold Wynn and my aunt Theresa Wynn and my aunt and uncle Gail and John Lyon. They all come when they can. What is a challenge, or challenges, you have had to face as an athlete? How did you overcome it? A challenge I have had is being a small shot put and discus thrower. I am only 5'2 and 130 lb. I have to use every ounce and part of my body when it comes to throwing because being short is a little bit of a disadvantage. However, I learned over time though to use it as a advantage, by using my quickness and have good technique to help me throw farther. 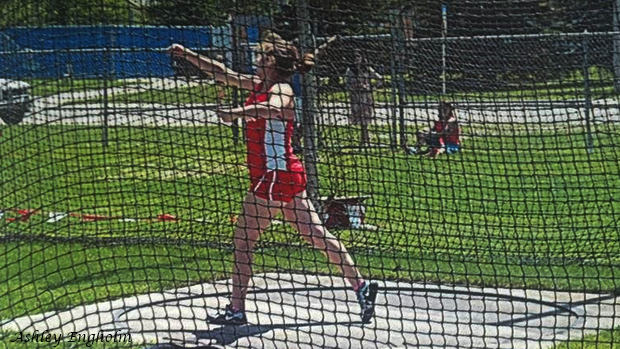 My main goals for this track season is to break our school discus record and to go to State again in both the shot and disc, and also to win. 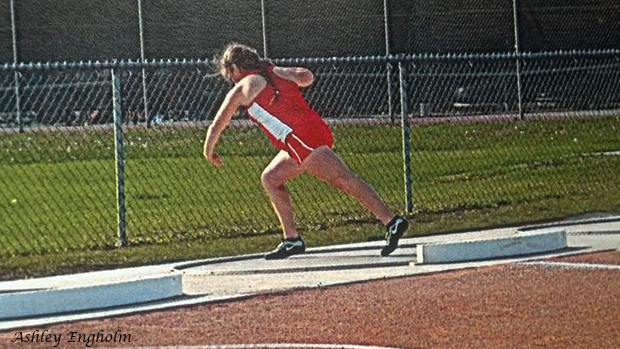 But most of all, I want to have a good, fun last track season. Looking forward to a fun last track season and to becoming a better-connected team. I plan on going to Central Lake College and then transfer to Bemidji State University to get my Special Education Teacher degree. My head coach Jamie Wagner has told us that routine plays a big role in performance. So I make sure that on meet days I wake up and make a protein shake (chocolate), and I either have a bagel with peanut butter and jelly or I go to school and have a grape uncrustable and have that with my shake. I wear the same sports bra for all my meets. I take a 26-minute nap before every meet, and I also listen to only Spanish music on the bus ride to the meets. I don't always listen to music at the meets, before throwing but when I need to get more focused and or pumped up I listen to only 80's-rock music before throwing shot put, and I only listen to either Spanish or Classical music before the discus. I pray both before and after I throw for both the shot put and the discus. I also usually don't talk to people (not even my parents) while in competition because I'm focusing and staying tuned with what I am doing. You would find me doing something with my family, like snowmobiling, swimming, campfires, or just sitting and having a cup of coffee and talking. You also would find me working at Dockside in Breezy and working at Causeway on Gull Resort. Take it practice-by-practice. You may not know what you want to do, and that is ok. But if you do, that's good too. I started off thinking I was a sprinter and long jumper and because I tried everything I eventually found what I was truly good at, but even then I didn't start off good either. Success comes from failure. Do you have any specific throwing advice or tips that you would like to share? In throwing there is no finish line so when you throw far, then you have to throw farther. Never rest until the good gets better, and the better gets best. Take everyday practice-by-practice because you can't rush success. Patience is a virtue. My record of chicken nuggets I can eat is 40.